From the grasslands of Nicola Lake, the men of the various brigades reached Kamloops by crossing the highlands between the Nicola valley and the Kamloops Lake valley. It’s a beautiful country, quite different than the Nicola. The hilltop (when I saw it at least) is almost tundra-like, with numerous small lakes scattered across a dark, rock-bound plateau, with some grass-covered hills. As we mount the hills from Nicola Lake by the old highway [not the new], we reach Stump Lake. It is mentioned in the journals of the fur traders, and so its name is very old. The second lake along the old route is Rock Lake, and the hill behind is called Brigade Hill. Though we are nearing the top of the hills, we are still climbing at this point. The plateau at the top seems very bare — at least that is the way I remember it. But Anderson remembered it differently, as you will see. Monday 8. Fine. Set out 3.45, 6 miles along the little river, crossing twice and passing a third small lake [Tynne Lake] connected with the rest [Otter Lake]. Leave river and strike across through fine country till we fall on the Louchamean road a little above the Rocher de la Biche. Proceed along it about 10 miles westward of N., then 5 miles N.N.E. to encampment on McDonald’s or Bourdignon’s River [Quilchena Creek], a steam falling into Lac de Nicholas. Tues. 9th. Fine. A missing horse delayed us till 5 o’clock [am]. Follow along the river 6 miles to Lac de Nicholas, then 4 miles to the second ford over a stream coming from S.Easterly direction [Nicola River flowing into Nicola Lake from the east]. The water was too high for us to cross loaded, so we carried the baggage over upon a tree and drive the horses across light. Breakfasted here. This is a much frequented summer fishery of the Nicontamenes… At 9 3/4 set out again. At 1 o’clock reached San Poila River [Campbell Creek] where we put down for a couple of hours to repose the horses, whose feet are very sore — they having been constantly on the march since spring. Leave San Poila River and strike across through a beautiful country to Kamloops, where we arrived at 6 1/2 pm. Wed. 19 May . At 10 am set out from Kamloops, striking towards Lac de Nicholas. At 5 pm (having delayed to refresh the horses during the interval) we reached the first brook running towards Lac de Nicholas, where we encamped… I met with an untoward accident this afternoon which nigh put an end to my exploration for the nonce. My horse stumbled & rolled completely over, I narrowly escaping a broken leg. Fortunately, though painfull [sic], the injury is less severe than I first feared. Fine and clear. May 20th. Sultry. Camped at the West end of the lake where I had appointed to meet Blackeye, from whom I hope to get some information in regard to the country we are to pass through. He is not yet arrived. There is a camp of Indians here and a larger one near the Eastern end, both drawn together by the carp fishery. May 21. Very sultry. Pursued the usual road followed by our trading parties on their way to the forks [of the Thompson’s River with the Fraser?] But on arrival at the ford we found it impracticable from the height of the water. Thus we are under the necessity of prolonging our journey by going to the mouth of the stream [Nicola River] where we expect to find canoes. Showery weather, with strong westerly gale all day. Leave encampment at 4 1/2 am; in two hours reach the ford of R. la Grimace [Maka Creek], a feeder of Nicholas [Nicola] River, bearing from our encampment N.E. by N. Thence three hours to the cold water river [Coldwater], another tributary of Nicholas’ River. Cross and follow down the right bank, through a fine country, till its junction with the main stream, a distance of about 20 miles, E.N.E. At 5 reach the West end of Nicholas’ Lake; 6 3/4 encamp near the discharge of Bourdignon’s or McDonald’s River [Quilchena Creek]. June 11. Heavy thunder showers, with hail during the day. Breakfasted near our camp of 19th ulto [May]; and at 2 1/2 pm reach Kamloops after an absence of 24 days, including those of departure & arrival. I have directed Mr. Michel Ogden to send a couple of additional horses, to meet the party in a few days from this, and tomorrow morning continue my route to Alexandria. 18th August. Marched about ten miles to a small River. 19th August. Marched 12 miles and encamped on Nichola’s Lake. 20th August. Marched along & encamped at the east end of Nicholas Lake about 8 miles. [They had gone along the south shore of the lake]. 21st. Marched 8 miles to east end of Stump Lake. 22nd. August. Marched 10 miles and reached Thompson’s River. 27 (or upwards) horses were killed & lost on this voyage. I don’t think we know exactly where the brigade trails went, but there is a Brigade Lake up on the height of land — and its creek does drain into Campbell Creek. That might have been one of their regular camping spots along the San Poila River. From the top of the plateau the fur traders would always have descended the hills to the Kamloops post. We will not. From this ridge of hills we will side-step Kamloops, and follow the north shore of Kamloops Lake west to Savona Ferry and the 1843 brigade trail. This trail led north from Kamloops to Lac la Hache via Loon Lake and Green Lake, and it was only used after 1843. I did not have this information when I wrote my book, and so some of this is new to me, and to other brigade trail researchers. 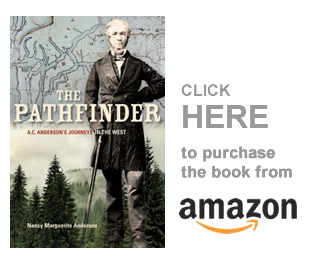 I also have copies of The Pathfinder available. My second book, Working Title: “The York Factory Express,” is now in my editor’s hands. 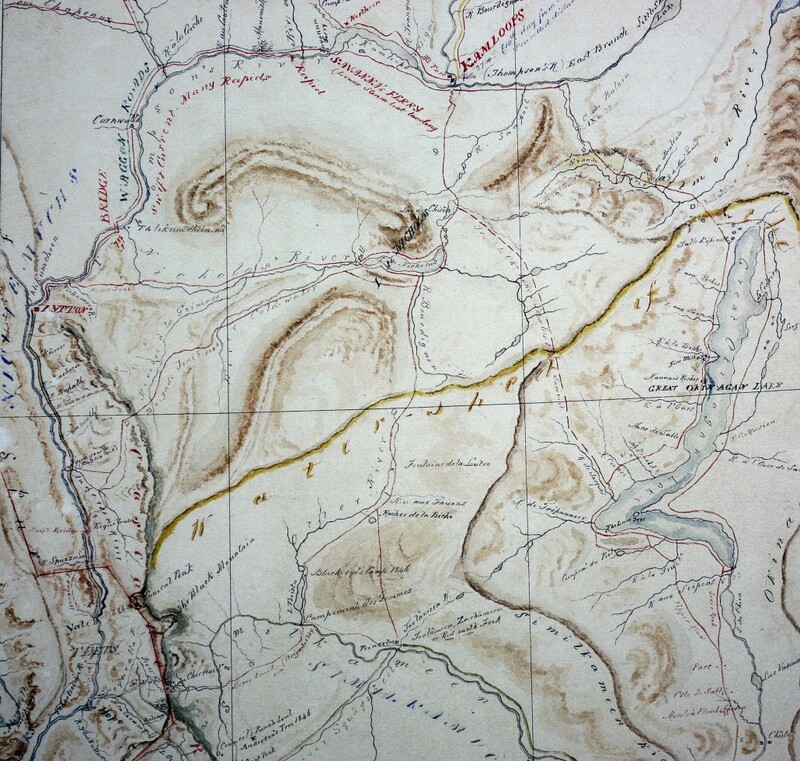 I will begin to write my third book, a history of the brigade trails west of the Rocky Mountains, immediately. It is always exciting to begin a new project, and I look forward to it! Thanks for your interest, and for following me around this interesting territory West of the Rocky Mountains! So many good stories! Copyright, Nancy Marguerite Anderson, 2015. [Updated July 26, 2015] All rights reserved.